Call for Nomination of AAPPS-DPP 2018 Plenary and Invited Talks . Call for Nomination of 2018 S. Chandrasekhar Prize of Plasma Physics. Preliminary Announcement of 2nd Asia-Pacific Conference on Plasma Physics. New DPP members from AAPPS-DPP 2017 and Pos Doc position in India. RMPP New Review Paper by Prof. Qiugang Zong on line. RMPP New Review Paper by Prof. Hideo Sugama on line. Book on Plasma Science and Technology from AAAPT Group. Metallic Hydrogen Article in Physics World. Summary of 1st Asia-Pacific Conference on Plasma Physics. Post Doc announcement at AAPPS-DPP 2017. Good success in 1st Asia-Pacific Conference on Plasma Physics Sept. 18-23. ASPNF2018 (29 Jan-2 Feb 2018) Chiang Mai, Thailand. 2017 S. Chandrasekhar Prize of Plasma Physics. Call for staff member application. Post deadline abstract submission will be closed on 18:00 July 20, AAPPS-DPP 2017. Call for application to 2 postdoctoral positions in USTC. Extension of deadline for abstract submission and Young research award to June 23 (AAPPS-DPP 2017). Extension of deadline for abstract submission and Young research award to May 31 (AAPPS-DPP 2017). The deadline for 2018 IUPAP conference sponsorship application is June 1, 2017. ICPSA 2017 - Walailak University, Thailand : sponsored by AAAPT. APTWG2017 (June 5-8, Nagoya - registration open . Call for 2017 S. Chandrasekhar Prize Nomination. Call for 2017 AAPPS-DPP Young research award. Deadline Extension of invited speaker nomination for 1st Asia-Pacific Conference on Plasma Physics (New deadline is January 15, 2017) . AAPPS-DPP Young Research Award at APPC-AIP 2016. Report on APPC-AIP 2017: S. Chandrasekhar Prize Ceremony. Report on APPC-AIP 2017 (Plenary talks). Report on 43rd/44th AAPPS councils. Reminder:Call for Invited/Plenary nomination of 1st Asia-Pacific Conference on Plasma Physics (AAPPS-DPP2017). Outcome of APS2017 Program Committee. Chairman of Reviews of Modern Plasma Physics. Call for Invited/Plenary nomination of 1st Asia-Pacific Conference on Plasma Physics (AAPPS-DPP2017). Preliminary Announcement of 1st Asia Pacific Conference on Plasma Physics Sept. 18-22, 2017. APPC-AIP Congress - abstract submission for poster is now open (reopen). IFSA 2017 to be held September 11-15. Information about EPS 2017 will come soon. SOUKENDAI Winter school in Thailand. Postdoctoral Position in Plasma Theory and Computation at USTC. AAPPS-DPP Journal Homepage is now open. AAPPS-DPP's Review Journal is coming close. 2016 S. Chandrasekhar Prize Press Release. Age limit for AAPPS-DPP Young Research Award. Deadline extension for AAPPS-DPP Young Research Award to July 4. Full ICPP2016 program is open. 6th East-Asia School and Workshop on Laboratory, Space, Astrophysical Plasmas. Closure of S. Chandrasekhar Prize nomination. IUPAP conference application. Deadline is June 1. An important paper published in Reviews of Modern Physics. DPP Member's new book publication. AAPPS council report (annual report of 2015 DPP activities). Report of ITER summer school 2015. EPS2016 2nd PC for oral talks. Report of 10 year cerebration of plasma physics lab. in Nepal. Prof. Francis Froyon passed away. 2015 S. Chandrasekhar Prize Laureate is Prof. Predhiman Kaw. 2015 S. Chandrasekhar Prize Selection. 2nd and final call for Abstracts for ICPSTA-2016. Report of SOKENDAI Asian Winter school. WLS and APPTC are jointly organized. Outcome of EPS 2016 program committee. Conference, on Plasma Science, Technology and Applications ( ICPSTA-2016). Job information at Australian National University. Notice of the 2015 ITER International School (IIS 2015). NAAPPS-DPP I-HAC member Prof. Toshiki Tajima received Enrico Fermi Prize at Italian Physical Societyo. KPS-DPP chair Wonhoe Choe encouraged KPS-DPP members to join AAPPS-DPP. Announcement on advertisement on DPP website and citation and accomplishment of Prof. S. Ichimaru(1st S. Chandrasekhar prize of plasma physics). Announcement of Sokendai Asian Winter School. Call for nomination of APPC-13 plenary/invited speakers. Abstracts deadline extended to 7 August for International Toki Conference (ITC25). 10th APFA s going to be held in Dec. 14-18, 2015 in Grandhinagar, India. There is request from Vice Chair Prof. Shiratani in charge of applied plasma physics as follows. Prof. X. Gao provided summary of APTWG2015rof. Rod Boswell . Report on Conference on Laser Energetics - Laser Astrophysics (CLE2015). Prof. Rod Boswell of Australian National University informed us the new job opportunity in plasma physics..
Notice of ISPC 22, which will be held during July 5 - 10 in Belgium. 8th International Conference on Plasma Science and Application. Website of ICPP 2016 6/27-7/1 is open as follows. Two announcements on two meetings. .
AAPPS Bulletin No 2,2015 is released which includes 31st AAPPS Council meeting. Announcement of 10th Anniversary Asian-European International Conference on Plasma Surface Engineering (AEPSE2015). Announcement of ICRP-9 / GEC 68th / SPP-33 at Hawaii. Announcement of 5th East-Asia School and Workshop. Announcement of 5th Asia Pacific Transport Working Group Conference (APTWG). Announcement of the 1st Conference on Laser Energetics (CLE2015). 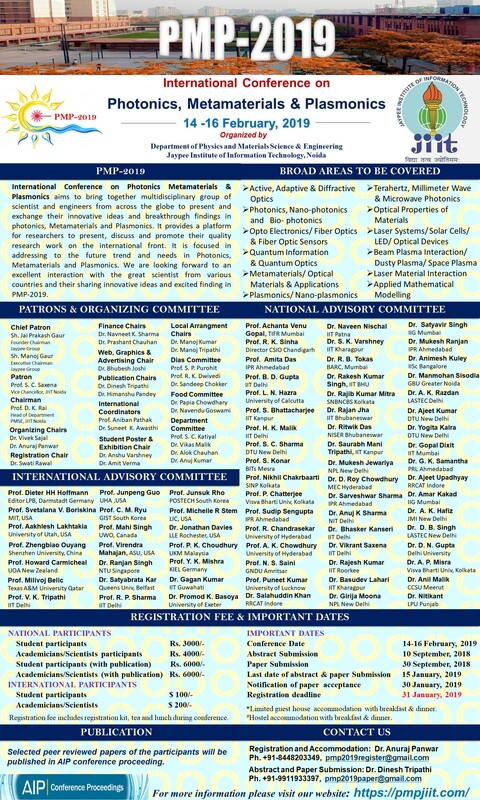 Announcement of 18th International Congress on Plasma Physics. February issue of AAPPS Bulletin is now on the Web. The 31st AAPPS council was held at Seoul on Feb.6-7. The council members are delighted to hear the DPP activities. There is slight change in Executive Committee membership. A summary report of 3rd A3 Foresight WS on Spherical Torus. S. Chandrasekhar prize of plasma physics. Report on AWS2014 held in December 2-5, at Toki, Japan. Report on Plasma Conference 2014 held in November 18-21, at Niigata, Japan. DPP News December 1,2014 . In the last Fusion energy conference, Nuclear Fusion prize laureates of 2013 and 2014 are cerebrated for their outstanding papers. DPP News November 25,2014. DPP ExCo decided to establish S. Chandrasekhar prize of plasma physics. LOGO of AAPPS DPP is determined. News on ICPSA2014 (22-24 September, 2014). Report on 4th APTWG (Asia-Pacific Transport Working Group) International conference. Notice of 4th East-Asia School and Workshop on Laboratory, Space and Astrophysical Plasmas. Three announcements were sent to members. Five announcements were sent to members. Document on the establishment of DPP has been submitted to the Editor-in-Chief of AAPPS Bulletin, Prof. Won Namkung (He is also our I-HAC member) in April 30. Both are eminent professor in plasma physics. SM is chairing ICPT plasma school in Trieste and HJ is famous for his reconnection physics and have many friends in Asian region. the International Conference on Geometric Algorithms and Methods for Plasma Physics, which will be held on May 13-15, 2014 in Hefei. http://icgampp.ipp.ac.cn/ This conference has some focus in the area of geometric algorithms for simulation studies. copyright©20XX AAPPSDPP all rights reserved.